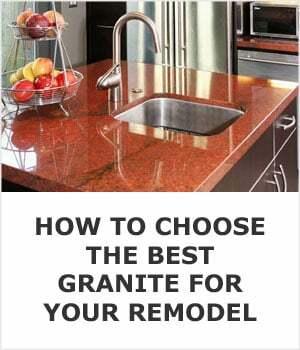 Which Types Of Granite Make The Best Countertops? This page is part of the affordable kitchen remodeling series, created to help homeowners design an elegant kitchen that fits their budget. You can access the entire series here. 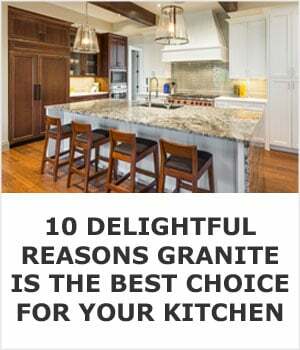 If you head over to the local granite warehouse you’re going to find so many options to choose from that the decision can seem impossible to make. 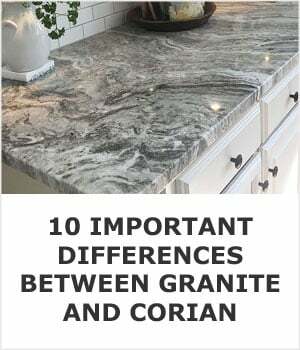 The goal of this page is to help you quickly narrow your choices by helping you understand how granite is made and how the color you choose effects the performance of the stone. 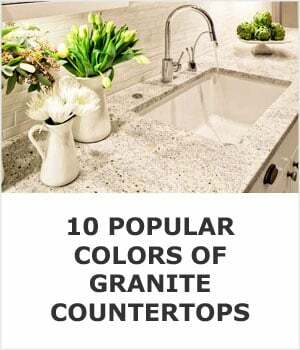 Below is a table of contents to help you quickly navigate this page, including a list of 10 high performing types of granite that you’ll likely be happy with for decades to comes. 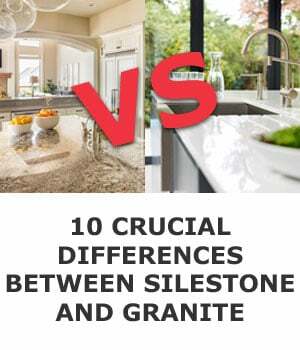 What Causes Variation In Different Granite Slabs? 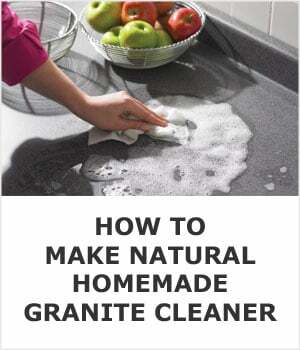 What Causes Different Granite Colors? There are few countertop materials on the market today that appeal to as wide group of a group of people as granite does. It’s natural stone quarried from around the world in huge slabs that can be cut and shaped to fit your kitchen, no matter what the shape, size, or layout you have in mind. Part of its appeal is the fact that it is a natural material; it isn’t made in a lab and while there are many stones with very specific characteristics to them, no two pieces are ever exactly the same. It’s this natural variation from piece to piece and within one piece of granite that gives it its beauty and a lot of its appeal. Granite is an intrusive igneous rock, which means that it’s formed by magma slowly cooling below the surface of the earth. True granite is a mixture of several different minerals, including quartz, mica, silica, feldspar, and other trace minerals that lend different colors to the stone. As the magma cools, the amount or concentration of each mineral may vary from section to section causing variations. The speed at which the magma cools will determine the size of the grains, the longer it took to cool the larger the individual grains will be. Often after it has cooled it is subjected to additional pressure. The pressure causes it to heat back up and get folded over like dough, but the temperature does not get hot enough for it to become a liquid again. This is what causes the different swirl patterns. Now instead of it being an igneous rock it’s classified as a metamorphic gneiss, but it still retains its’ original mineral composition and makes for an excellent countertop. Different minerals cause granite to have very distinct colors. Let’s quickly run through the most popular color options: black, white, brown, pink, and red, and touch on some of those specific minerals. In order for a stone to technically qualify as granite it must be made up of at least 20% quartz, a white to milky colored stone. Two popular examples are black galaxy and absolute black, neither of which contain enough quartz to qualify. Composed mostly of gabbro, it still makes for an excellent kitchen work surface, so if you love it don’t be afraid to buy it. Different shades of feldspar are what most commonly give brown granite its’ tone. Granite will never be pure white. At the very least it will always have a mix of milky and opaque creams and alabasters from quartz and feldspar. You’ll commonly find slabs that are predominantly white with blacks (amphibole or gabbro) and browns (amphibole or feldspar) thrown into the mix. 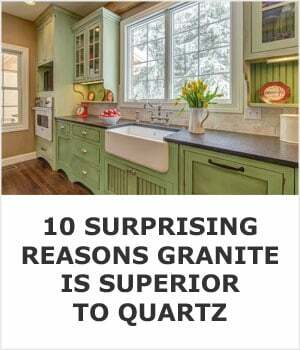 If a monolithic white countertop is what you’re after have a look at what has been termed “quartz countertops”. 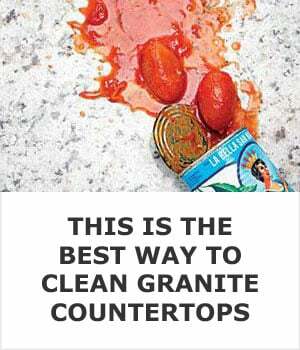 It’s in quotes because it’s a man made kitchen work surface that is made from crushed quartz stone and resin used to bind the pieces together. The resin makes up more than 25% of the finished product by volume so I feel it’s important that you’re not lead to believe it’s a natural stone just because it shares a name with a naturally occurring mineral. Pink, while not a popular option for countertops you do see it used quite a bit as a building material. It does make for a very pretty counter thanks to an abundance of the mineral potassium feldspar. Red is slightly more popular and its’ coloring is also due to potassium feldspar. In the case of red the mineral has simply taken on a deeper hue. While much more uncommon, it’s also possible that the reddish hue is due to the presence of iron oxide. If you come across any striking shades of red that have consistent coloring throughout, instead of the mottled look that you get with natural stone, it’s likely quartz or lava stone. Both are an excellent choice if a modern kitchen is the look you are after. Over the last 3 years exotic colors have been making their way into the market. The one I have seen most often is a vibrant blue but you make come across bright reds and deep greens as well. These are usually being misrepresented as granite when in fact they are likely larvikite or labrdorite (blue), or marble (green). There’s also the distinct possibility that they are actually granite that has been impregnated with a dye or coated with a colored resin to give it a vibrant hue. I’m not going to tell you not to buy a jewel tone but I will say “buyer beware”. As a rule they tend to be much more problematic than natural stone, and with all the beautiful natural options available at the stone yard I’m sure you will find something you love even more than a dyed slab. While there are hundreds of different granites to choose from, many people tend to go shopping with a specific range of colors in mind. The following 10 stones represent some of the more popular colors that are also among the most durable and have stood up to the test of time in millions of homes for hundreds of years. You don’t have to limit yourself to this list but it makes a great starting point. If you’re unsure of what any of these look like we have a picture gallery that includes the below list of colors plus many more at this link. Quarried in India, White River (sometimes also called River White) is a very light stone with a deep gray vein that often presents as broken or flecked. This stone is fairly consistent in tone; it’s rarely seen in darker shades, and from a distance often presents as white, although the most common characteristic is the fact that it features small deposits of red minerals throughout its surface. Cotton White is another light-colored stone that has very low variation. Quarried in Brazil, this stone features a white background with a mottled gray or black surface. The amount and depth of the gray will vary from slab to slab from a distance it can be easily identified as a white stone. Also quarried from Brazil, Delicatus is slightly more dramatic. It has a clean white background that is a little brighter than Cotton White. This surface is marked by black biotite crystals, which stand out very brightly against the white background. Ice White is another Brazilian stone. This granite has much more variation than the other options quarried in the same area. It ranges from having a bright white background to a soft gray to an icy white/blue. It’s marked with deeper gray and charcoal flecks, and may also have some soft cranberry flecks as well. This stone must be seen in person to find the best fit for the kitchen it will be installed in. Himalayan White is arguably the most popular of the lighter shades of granite today. It has a soft white/gray background with a darker gray vein. It’s more reminiscent in color to popular Italian marbles, although it is also quarried in Brazil. It has a low level of variation in terms of color, but the amount and placement of the veins can vary from piece to piece. True Absolute Black granite isn’t a granite at all – it’s a gabbro, one of the densest and hardest igneous rocks available. This pure black stone has no variation, flecks, or veining, although it may have a slightly crystalline look to it when polished. If honed, the stone softens to a very deep charcoal gray in color, letting it fit in with many decors. Seen as black from far away, Uba Tuba is actually a very dark green stone that features a lot of mica. It also features flecks of cream, gold, and sometimes turquoise blue, which gives you a lot of options for finding colors to blend and match with the stone for accents in the kitchen. With its subdued appearance from afar and its rich colors up close, Uba Tuba appeals to a very wide group of people, particularly for traditional kitchens. Black Galaxy is another black gabbro, or very dense igneous rock. Unlike Absolute Black, however, Galaxy’s surface is sprinkled with bright copper-colored flecks that catch the light and bring a lot of interest and dimension to the stone. There are no veins in Black Galaxy, and very little variation from piece to piece, making it a good, consistent stone. Any granite labeled “Pearl” will have a very luminous and pearlescent sheen to it thanks to the high concentrations of mica in the stone. Pearl can be green, blue, black, or even lavender in color. Look for the color name of the stone to give you its base color. Each color has little variation beyond lights and darks, and the occasionally larger than average mica piece. While it’s called Coffee Brown, this stone could sometimes better be described as maroon in color. A dark red/brown stone with hints of gray, blue, black, cream, and true brown, Coffee Brown is a very dark stone that is fairly consistent in color. Rarely, you will find slabs with large splashes of darker color, but overall this stone is consistent in color, while the size of the grain can vary. No two pieces of granite are ever exactly the same. Even very consistent stones will have small amounts of variation, including colors that are lighter or darker, secondary or tertiary color flecks that are present or missing, highly visible or non-existent veins, or even whole sections of a slab that don’t look like the rest. Protip - Always take the advice of your fabricator. Nobody knows the idiosyncrasies of each slab type better than they do because they work with it day in and day out. Their advice is more valuable than any designer, website, or salesperson; especially a salesperson at a big box store like Home depot or Lowe's. For this reason, no matter how much you like a sample in a showroom, it’s best to pay a visit to your local fabricator and the granite wharehouse to choose your slab in person. It’s the only way to guarantee you’ll be completely satisfied with the finished product. 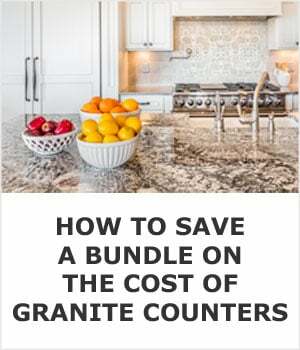 Here’s a link to our extensive buyers guide to ensure you get the perfect countertop at the lowest possible price. Would you like to design an elegant kitchen that fits your budget? Here are a few articles I wrote that can help. To start saving today put your email in the box below and press the green button. I'll instantly send you the information by email.